Printable Monthly Calendar: Beautiful & Modern! 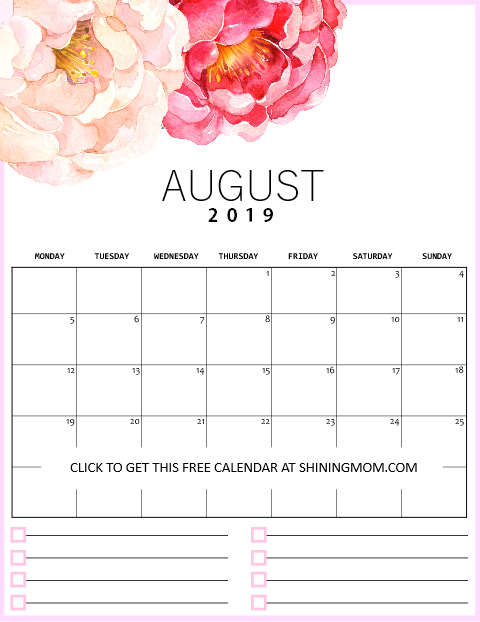 If you’re still looking for that perfect printable monthly calendar to print, here’s another lovely 2019 calendar for free download! It comes modern, clean and minimalist in beautiful florals in Monday to Sunday format. Having this with you in your monthly planning is going to be amazing. Keep scrolling to get yours today! Hello, friends! Welcome back to Shining Mom! It’s the time of the year that we scour the net looking for that perfect printable monthly calendar to print, isn’t it? I am happy to announce that I am sharing another lovely design today. 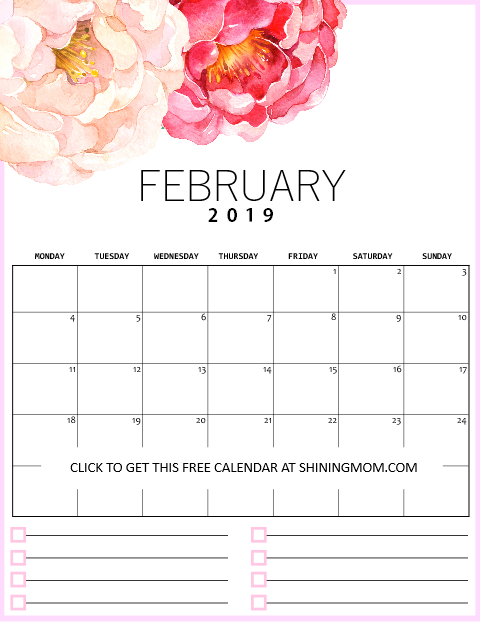 If you love to use a clean and pretty calendar with a spot where you can write your monthly tasks, priorities, goals or to-do’s, I am pretty sure you are going to love this free printable monthly calendar 2019 that I have created for you! Let’s take a closer look at how beautiful and useful the design is! Printable Monthly Calendar 2019: So Beautiful & Practical! This calendar won’t let you miss any relevant date, task or event again! View the minimal and functional layout that can immensely help you organize the months ahead. As you can see, there’s a checklist at the bottom of every printable monthly calendar 2019 where you can write all those important to-dos and goals for the month. I have also added boxes where you can tick off your list. Ahh, such a gorgeous floral calendar with a modern look and functionality. Let’s us take a closer view to some of the printable calendars that I have here. You can only preview calendars for January, February, March, May, and August in this post but you’ll be receiving the complete January to December 2019 files later on. The download link can be found towards the end of the post so keep scrolling down. A special shoutout to Octopus Arti for hand-painting the beautiful flowers I used in creating your printable monthly calendar 2019! As I have said earlier, this is a special calendar with Monday as the start of the week because several of you have requested for it. I know moms with school kids, and office workers would love to have this format as they can easily use the calendars for their weekly planning, too. So if you are one of those who has requested for a printable monthly calendar 2019 in Monday-Sunday format, here it goes! Surprise Treat: A Free Weekly Planner! Here’s another awesome surprise for you! I have also added a weekly planner to complete your planning needs. Take a look at this modern and minimal weekly planner layout. You can easily organize your week right in this pretty weekly planner. It has a spot where you can identify your weekly priorities, shopping list, major to-dos, and meal plan. There’s also space for you to write down other notes and reminders for the week! Won’t organizing your 2019 be using these printables? 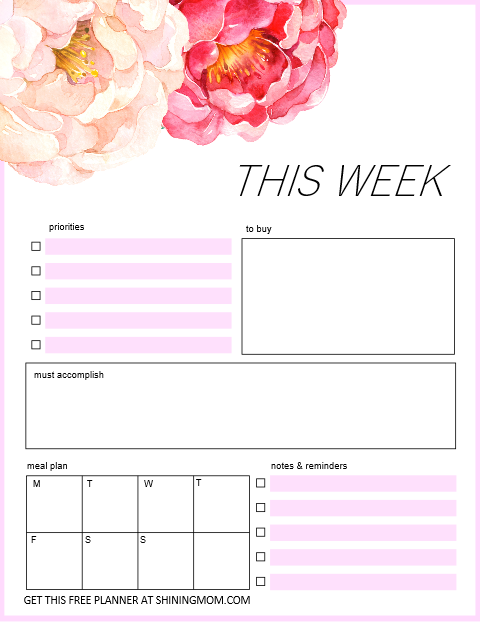 This free weekly planner is also included in the printable files that you will be receiving. Ready to snag yours? Click here to Instantly receive the calendar and planner files. Remember, the printable monthly calendar 2019 and weekly planner are designed to be printed out in standard, letter-sized paper. An A4 size paper can also be used, just be sure to adjust your printer setting to “FIT TO PAGE”. 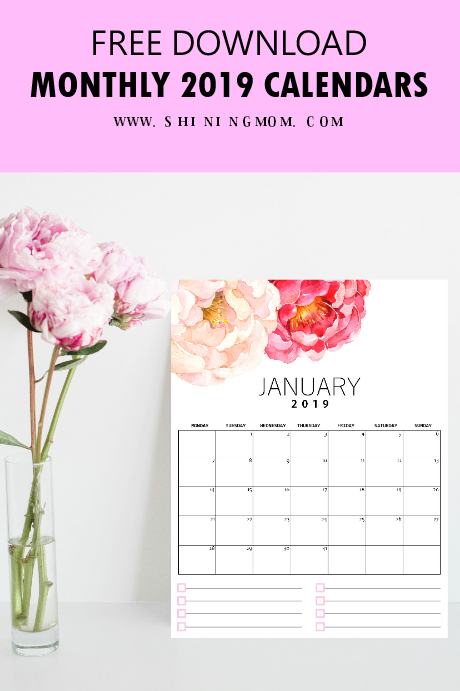 If you love this monthly calendar, I am pretty sure you are also going to love our the other printables and calendars for you. Hop over to the following trending planners and calendars that are all for free printing. And if you are a Mama just like me, you might want to check out the ultimate planner for moms, the Every Mom’s Planner available at our shop! Lastly, don’t forget to pin this post at Pinterest for future use! 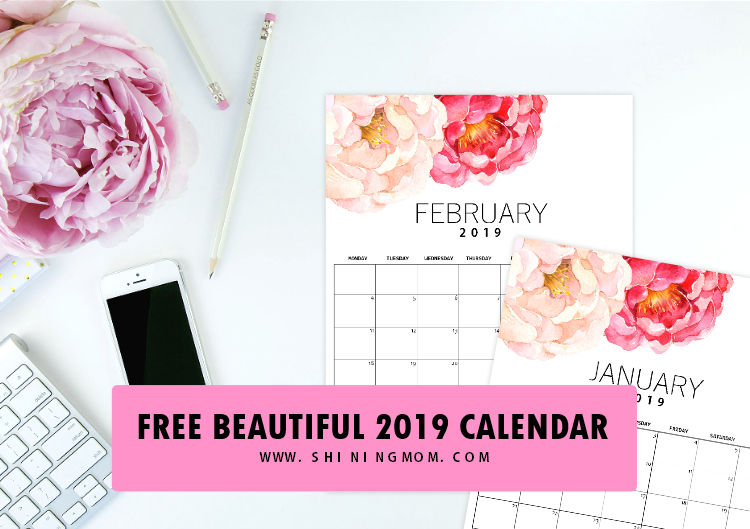 You will also help spread this beautiful printable monthly calendar 2019 that way! Happy planning, friends! I have tons of free organizers and planners lined up for 2019. See you again very soon! « 2019 Free Printable Calendar for Kids: Fun, Cute, Colorful!